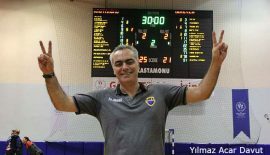 Hentbolhaber.net contributor Dr. Altay Atlı was one of the handful who were on the stands in Istanbul watching Beşiktaş Mogaz against SG Flensburg-Handewitt. Here is his take on the match. Yes, you know that, right? SG Flensburg Handewitt, the winner of VELUX EHF Champions League in 2013-14, currently the top ranked team in the group, winner of several trophies in Germany, was in Istanbul. In other words, the crème de la crème of European handball was in Istanbul. Yet handball fans in Istanbul were either not informed or not interested in this. The game, which was played in the majestic Sinan Erdem Dome, was attended by only 350 (in writing: three hundred fifty) spectators. This is truly sad, and measures need to be taken. We can perhaps discuss possible ways of action in another essay, but for now, let us put straight the different dimensions of the problem. To start with, it is a real problem for the players of Beşiktaş to have to play without the support from fans. But the real issue is not this absence of support. Before the game between Beşiktaş Mogaz and SG Flensburg Handewitt we witnessed EHF delegates taking pictures of the empty stands with their mobile phones. And yes, they took a lot of pictures! Now it is not difficult to imagine what kind of reports these pictures will be attached to and what kind of comments will be accompanying them. In the meantime, Frank von Behren, commentator in German Sky TV’s broadcast of the game said that the place was like “Geisterkulisse”, a ghost venue! Turks have a saying: “inler cinler top oynuyordu” which literally translates as “ghosts and djinns playing ball”, used to depict places where there is no soul around. So that was basically the case! In Sinan Erdem Done there were two matches, Beşiktaş playing against Flensburg, while at the same time ghosts and djinns were playing ball! So the problem is not only that Beşiktaş’s players are not receiving fan support. The real problem is that the perception of “there is no interest for handball in Turkey” in European eyes and especially vis-à-vis the EHF is getting sharper every day. And this perception is unfortunately likely to have consequences for Turkish handball. Coming down from the stands to the playing court, the match was merely a repetition of Beşiktaş’s now familiar performance in VELUX EHF Champions League. We saw a team playing a balanced and in some part a superior game against a strong opponent, but then losing power and falling behind. Actually it was Beşiktaş who made a forceful entry into the game, and it was 4-1 for the home team before it was even the fourth minute. The highly experienced German team, however, did not let them go too far, and soon they balanced the core. In the first half, Beşiktaş could not make efficient use of its right back and left back positions, however a strong linkage could be established between the center back and the line player, and score production was possible through effective game formations between Nemanja Pribak and Tolga Özbahar. Flensburg responded with a high-speed game, managed to go down to the opponent’s field very fast and forced Beşiktaş to mistakes. The most productive player was Holger Glandorf who scored eight goals in the first half only through distance shots from the right back position. The fast tempo on the court led to a toughening of the game and a number of yellow cards and two-minute suspensions had to be issued by the referees. When it was the 20th minute of the match, Beşiktaş was leading with 12-11. During the latter part of the first half, we was Beşiktaş doing more mistakes when passing the ball, leaving larger gaps in defense, and Flensburg closed the first half with a 17-16 lead. During the early second half, Beşiktaş did its best to keep the balance, however after the 40th minute or so, not much power was left. More mistakes were made in defense, offensive lines were broken, no effective formations could be established and not much scores could be produced. 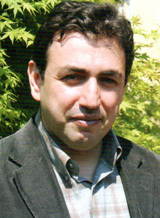 Beşiktaş was unable to rotate players, which made the collapse inevitable. 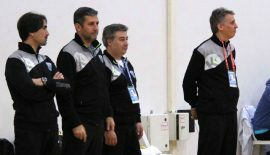 The way things were going on the court resulted in demoralization on behalf of Beşiktaş players. There is no need to tell what happened next, the goal difference widened and SG Flensburg Handewitt won the match by eight goals, with 34-26. European handball is now entering a winter break. There won’t be any matches in VELUX EHF Champions League until February. We are sure that Müfit Arın and his players will make the best out of this break. At the post-match press conference we asked Arın about what the yare aiming at for the rest of the competition. 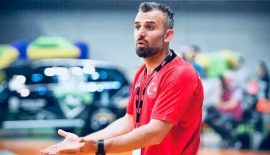 He pointed at the objective of “having a Beşiktaş that can fight well”, whereas Ramazan Döne, the star right back, said “we want to prove to people that we can play handball too”. In fact, Beşiktaş has already achieved these objectives. Beşiktaş is playing good handball, it is playing European level handball and although it has not been able to get the points it wanted, Beşiktaş has proven that it belongs to VELUX EHF Champions League. However, we cannot say the same for Istanbul and Turkish handball fans. There is a clear picture in front of us. In Sinan Erdem Dome, you have the Champions League on the court, but the regional league in the spectator stands, perhaps not even that. This has to change. What we need is not to fill the stands with “football fans” just for the sake of supporting the team with the noise they make. 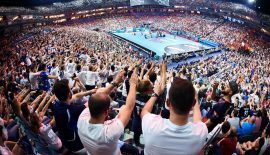 What we need is to have “handball lovers” filling in the stands, those people who open their hearts to the blub they love and to handball at the same time, those who watch the game with knowledge and joy, who can face both victories and losses with maturity. We need to get those young athletes, the children, who will watch the starts of Beşiktaş and Europe, who will learn from them and get inspired. We can discuss ways of achieving this during the winter break, but let us be very clear on one thing: This is not only a responsibility of Beşiktaş, the entire Turkish handball community has to do what it can.